This is a link to some current beekeeping classes available around the metro area. This class is starting this week. There are spots available. If you have been struggling with your bees over the last year or two. Maybe you are doing something wrong. One small management task done incorrectly can lead to poor results with colony survival. A good foundation of beekeeping knowledge can help you bee successful. This is a great beekeeping class. The five sessions can give the beekeeping student time to absorb all of the information presented. 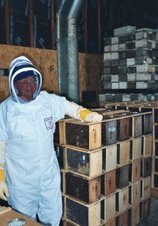 The instructor is well versed in beekeeping and has taught many beekeeping classes around the metro area for several years. What is happening on the bee front.